This illustration from the July 16, 1948, U.S. News magazine shows the beginnings of American containment policy. The U.S. is seen sending troops, advisors and weapons to Turkey in hopes that the country will resist communism and remain democratic. Communism was on the march. When the Red Army marched on Germany, it quickly absorbed the nearby nations Estonia, Latvia, and Lithuania into the Soviet Union. Soon communist forces dominated the governments of Romania and Bulgaria. By the fall of 1945, it was clear that the Soviet-backed Lublin regime had complete control of Poland, violating the Yalta promise of free and unfettered elections there. It was only a matter of time before Hungary and Czechoslovakia fell into the Soviet orbit. Yugoslavia had an independent communist leader named Tito. When Harry Truman approved the Marshall Plan in 1948, his official statement said, "Few presidents have had the opportunity to sign legislation of such importance." And now Stalin was ordering the creation of a communist puppet regime in the Soviet sector of occupied Germany. How many dominoes would fall? United States diplomats saw a continent ravaged by war looking for strong leadership and aid of any sort, providing a climate ripe for revolution. Would the Soviets get all of Germany? Or Italy and France? President Truman was determined to reverse this trend. 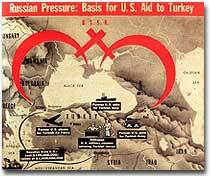 Greece and Turkey were the first nations spiraling into crisis that had not been directly occupied by the Soviet Army. Both countries were on the verge of being taken over by Soviet-backed guerrilla movements. Truman decided to draw a line in the sand. In March 1947, he asked Congress to appropriate $400 million to send to these two nations in the form of military and economic assistance. Within two years the communist threat had passed, and both nations were comfortably in the western sphere of influence. A mid-level diplomat in the State Department named George Kennan proposed the policy of containment. Since the American people were weary from war and had no desire to send United States troops into Eastern Europe, rolling back the gains of the Red Army would have been impossible. In July 1947 a majority of the American public had never even heard of the Marshall Plan. But to win passage in Congress, the Truman administration needed strong public support, so it launched a massive public relations campaign. But in places where communism threatened to expand, American aid might prevent a takeover. By vigorously pursuing this policy, the United States might be able to contain communism within its current borders. The policy became known as the Truman Doctrine, as the President outlined these intentions with his request for monetary aid for Greece and Turkey. In the aftermath of WWII, Western Europe lay devastated. The war had ruined crop fields and destroyed infrastructure, leaving most of Europe in dire need. 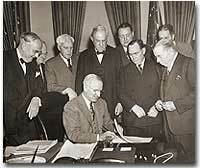 On June 5, 1947, Secretary of State George Marshall announced the European Recovery Program. To avoid antagonizing the Soviet Union, Marshall announced that the purpose of sending aid to Western Europe was completely humanitarian, and even offered aid to the communist states in the east. Congress approved Truman's request of $17 billion over four years to be sent to Great Britain, France, West Germany, Italy, the Netherlands and Belgium. In a speech to Harvard University in 1947, Secretary of State George C. Marshall proposed that a post-war European aid program be initiated. Less than a year later, the Marshall Plan was a reality. The Marshall Plan created an economic miracle in Western Europe. By the target date of the program four years later, Western European industries were producing twice as much as they had been the year before war broke out. Some Americans grumbled about the costs, but the nation spent more on liquor during the years of the Marshall Plan than they sent overseas to Europe. The aid also produced record levels of trade with American firms, fueling a postwar economic boom in the United States. Lastly and much to Truman's delight, none of these nations of western Europe faced a serious threat of communist takeover for the duration of the Cold War. After World War II, Europe was in ruins. George Marshall devised a plan for long-term economic and industrial recovery for most of Europe. But the $10.25 billion plan was more than just a humanitarian effort, it was meant to help contain the spread of international communism. 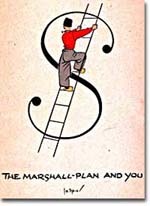 This website has a summary of all the parts of the Marshall Plan and its results. Fifty years have passed since the Marshall Plan helped rebuild Europe after World War II, and to mark the occasion the Library of Congress has put together an online exhibit of Marshall-related documents. Select from the many titles in the index to find an overview and a link to each document. An outstanding resource. There's nothing American presidents like more than getting their own doctrine. Like the Monroe doctrine, the Truman doctrine states the American stance on potential aggression and what the consequences might be. 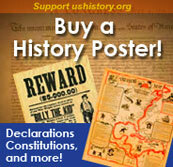 This webpage offers the full text of the March 12, 1947, speech Harry Truman gave to a joint session of Congress. From 1944 until 1992, a regime led by Marshall Tito controlled Yugoslavia. Although Tito died in 1980, his cohorts were able to maintain control for another 12 years. This illustrated webpage takes a brief look at Tito's rule and its effects on the nation. Stunning images from the National Portrait Gallery pay tribute to George Marshall in this online exhibition. Each of 14 thumbnails links to additional pages on highlights of the life of the solider-statesman, his associates and his accomplishments. Enjoy! Even behind the "iron curtain," Poland attempted to exercise artistic freedom. But Polish artists had to learn to live with the possibility of "attacks and gunfire" when trying to display or perform their art. 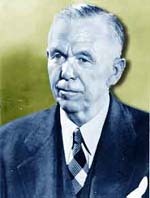 George Marshall had a reputation for being all-business, but he knew when to give a subordinate a chance. Learn what that meant for Dwight "Ike" Eisenhower and for America. The "Father of Containment" speaks! At age 92, George Kennan sat down for an interview where he revealed much about his ideas on communism and his life of civil service that began in the 1930s.